When you hear someone speak of great American road-trips a flood of images can run through your mind. Whether you prefer mountains, beaches or small town USA, all of these can be found on the road. This is our favorite way to travel, as it allows us to immerse ourselves in the scenery. While short trips are easiest to plan and execute, sometimes we feel the need for a long journey. Such was the case when we made our two week Rocky Mountain Road Trip. Our planned route would take us across Nebraska, and into Wyoming. While there are many sights to see in this region, we were only concerned with making a mad dash toward the mountains. While the idea is to cover as much ground as possible, we do realize that the monotony has to be broken up periodically. For this simple reason I look for tourist traps. Everyone has seen them. The billboards start appearing with teasers miles before the actual stop. The hope is to build anticipation to the point that you have to stop to see the amazing stuff they advertised, and many have it down to an art. Of course stopping at one of these can be entertaining, as long as you realize that it will probably NOT be the best thing since sliced bread. I do try to set a few ground rules concerning these stops: 1) It must be close to the road we are on. 2) It must have restrooms. 3) It should also offer the chance to purchase some kind of treat for the next leg of the road. On this part of the trip I found just the thing in North Platte, Nebraska. 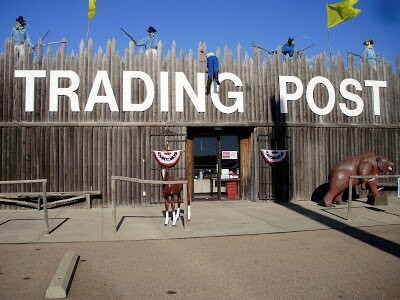 Sitting just north of I-90 at Exit 177 you will find Fort Cody Trading Post. It certainly fit the three requirements I have listed, and as an added bonus it was completely over the top in an amusing way. 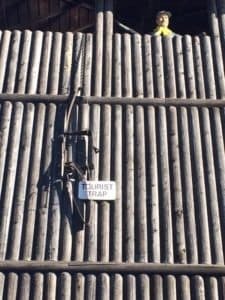 What appears to be an old log pole fort is filled with dioramas and displays meant to take guests back to the days of Buffalo Bill Cody. There are photo opportunities galore for those wanting to memorialize their visit. The stop has enough to keep you entertained, while you stretch your road weary legs. After a short visit we were back on the road. There were a few other sights that we considered, but the decision was to save these for a trip that was more focused on this specific region. By evening we arrived in Casper, Wyoming and found our lodging, and headed out to dinner at a locally owned restaurant. Our choice was The Fort Saloon n’ Eatery, which has all of the character one would assume in the Wild West. 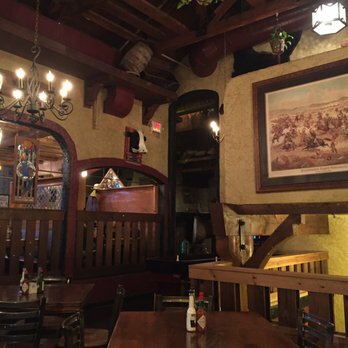 Heavy on wood, leather, and loaded with animal mounts, the place is filled with plenty to look at, while you dine. Burgers and fries were our choice, and the food was good, but just standard fare. We ended the day back at the hotel. By this point we had already traveled about 800 miles, and we had done it in a day and a half. While certainly road weary, we were content in knowing that the pace would slow for a while. We woke with the goal to make it to Cody, Wyoming by evening. This section is just over 200 miles, and estimates at about 3 1/2 hours driving time. A more manageable pace could be considered, and this also allowed time for a few stops along the way. 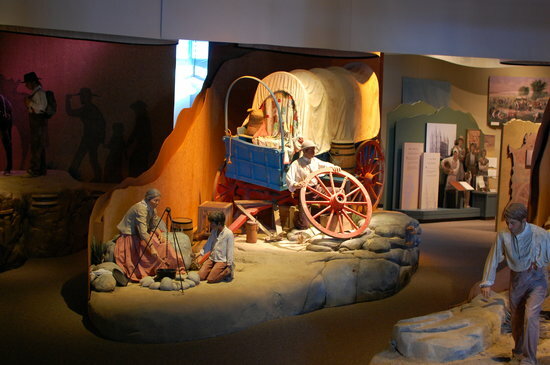 After a quick breakfast, we made our way to the National Historic Trails Interpretive Center, which was just up the hill from our hotel. We arrived just before opening, which gave us time to watch a small group of Pronghorn antelopes graze just outside the entrance. 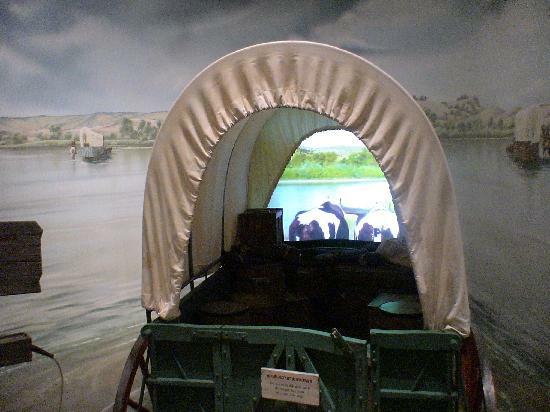 The museum was awe-inspiring, as it laid out the hardships that our ancestors experienced on the journey of Westward Migration. What was slated as an hour stop, easily turned into two hours. We left with our minds filled with a better understanding of life on the plains. 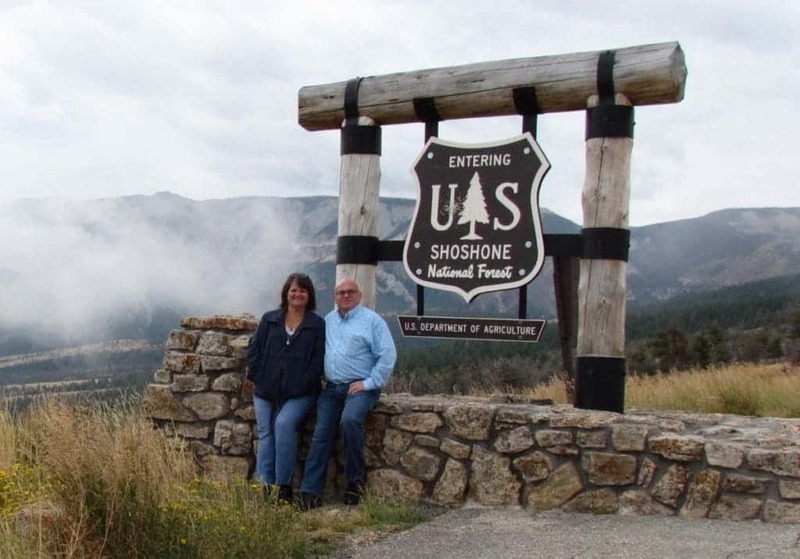 Back on the road, we headed west on 20 Highway toward Shoshoni. While planning our route, I had stumbled along an oddity, as tourist attractions go. I have an inclination to enjoy what Crystal refers to as “bad” movies. Now I must admit that they are not always filled with the best acting, scripts, plots or other pieces that make a movie Oscar material. What they are filled with is action, and no requirement to think while watching. One of these that I seem to be attracted to is Starship Troopers. For those unfamiliar, it is a sci-fi flick about humans in space fighting intelligent bugs. That is pretty much it. I was shocked to find out that we would be passing the area at which they filmed much of the bug fighting scenes. Of course this was a must see, and was silently added to the trip plan. As you travel west on 20 Hwy, you will come upon this site with little to no fanfare. There are a couple signs noting that you are approaching “Hell’s Half Acre“, but without prior knowledge most would pass right on by. Not us. This 150 foot deep gorge covers about 300 acres, and looks similar to the landscape of the Badlands area. For those familiar with the movie, you can almost imagine them pulling the “Big Bug” out of the cave near the end of the movie. Needless to say, while it was interesting to see, this stop did not take a long time. The area is fenced off to prohibit wanderers, so a few quick pictures, and we were back on the road. We hurried on our way, and soon the highway took a northern direction on our way to Thermopolis. Here we stopped for a quick lunch at Black Bear Cafe, before our next destination. I have always been fascinated by dinosaurs, and this trip offered lots of opportunities to explore regions where they once walked the earth. The Wyoming Dinosaur Center leaves much to be desired from the outside, as it looks like a large warehouse. Upon entering the museum you are astounded at the sheer amount of skeletons on display. Everywhere you look there are more to behold. For those who plan early, you can even reserve a spot on an actual dinosaur dig, but be aware it comes with an extra cost. We enjoyed a lengthy visit, but soon turned our attention back to the road. We had about 1 1/2 hours of drive left to Cody, and there was one more stop we had planned along the route. About an hour down the road we arrived in Meeteetse, which is about 3 blocks long. Located in this tiny town is the Meeteetse Chocolatier, who is lovingly known as the Cowboy Chocolatier. This bronc rider turned chocolate maker offers up delicious treats that were not to be missed. After much deliberation, we chose our favorites, and headed down the road towards Cody. We arrived in time for dinner at the Wyoming’s Rib & Chop House. The food was delicious, and the meal was as hearty as one would expect in this part of the country. An interesting side note for this restaurant is that they cover the tables with sheets of brown Kraft paper, and offer a supply of crayons. While waiting for the various courses of your meals, you can while away the time by creating your own masterpieces. As entertaining as it was for a couple of adults, we can only imagine how much kids must like the idea. After dinner we made our way to our lodging, and prepared ourselves for our next leg of our Rocky Mountain Road Trip. Tomorrow we would enter Yellowstone National Park. Thanks for sharing, this is exactly the type of trip that I like too….although it will take longer coming from CT. Great pictures, too. This summer we will be heading to the northeast, which is a long trip for us. You all have so many great spots up there. I have never been to this part of the USA, but I just can’t wait for doing it one day ! We certainly hope you get to. Sadly, I had the chance to visit Wyoming during my visit to Colorado, but couldn’t make it due to sleep deprivation. I did get to enjoy the Rocky Mountains while in Colorado, the views are breath-taking in that part of the US! That is truly a shame. We will be posting an article about Rocky Mountain National Park later this month. I hope you enjoy it.